What do drinking clean water, washing clothes, cooking, and flushing the toilet all have in common? They all make use of copper pipe in order to provide clean and safe water for consumption. In fact, copper pipe is a key component of most of the everyday appliances we use and take for granted. Copper pipe is remarkably resistant to two of the biggest problems encountered in plumbing: corrosion and bacteria buildup. A protective layer on the inside of the copper pipe, called a patina, makes the pipe corrosion resistant, making it unnecessary to replace pipes often. In terms of bacteria, copper is innately antibacterial, meaning that germs cannot live near it, ensuring high quality drinking water. Taking into account all of these benefits, copper pipe is one of Shanghai Metal Corporation’s most important products. Copper pipe has three primary types, being type K, type L, and type M. Type K is the thickest and is suited to water distribution, fire protection, oil, and other high pressure industrial uses. Type L has the second thickest wall, and has the widest range of possible uses among the three types, with many in interior plumbing. Finally, type L has the least thick wall of the three types, with applications in domestic water service and vacuum systems. 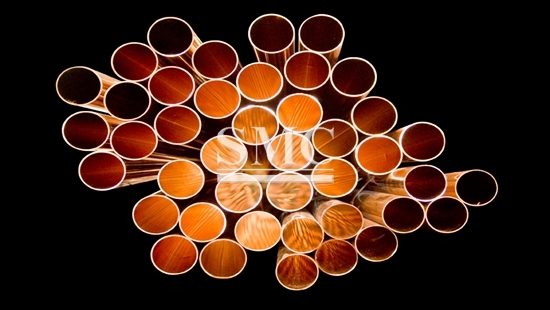 Shanghai Metal Corporation has developed two unique versions of copper pipe. The first is Aluminum Clad Copper tube (ACC tube). With a thermal performance at least 8 times stronger than aluminum and unmatched formability, make this kind of copper tube ideal for air conditioning and refrigeration purposes. AAC tube is lighter than regular copper pipe, making it an excellent choice for businesses wishing to cut costs! The second unique version of copper pipe is Copper Clad Aluminum Tube (CCA tube). This version has superior heat-transmitting performance, heat conduction, and elongation, making it the perfect choice for radio frequency cables and connection tubes. The aluminum used reduces the weight of the tube without sacrificing performance. You know what that means right? Lower Costs! Shanghai Metal Corporation has over 30 years of experience in the copper industry and is proud to supply business and households everywhere with top quality copper pipe. Are you looking to invest in your own business or to reduce costs? Copper pipe is sure to provide you with reliability and efficiency, at a low cost. For inquiries and a list of products, please click here.